If you want a bit of heat, try adding a pinch of cayenne pepper. I think a stronger cheese would also work well but I always enjoy the extra bit of melt from the mozzarella cheese. This filling would be great to make a large batch and use it throughout the week in these quesadillas, on salads, or chopped up and put on nachos. Preheat oven to 400˚. Cut the onion and peppers into small chopped pieces. Toss the onion and pepper with the sweet potato, olive oil, smoked paprika, garlic powder, and sea salt until everything is well coated. Spread vegetables in a single layer on a large baking tray. Roast until tender and lightly charring, 25-30 minutes. 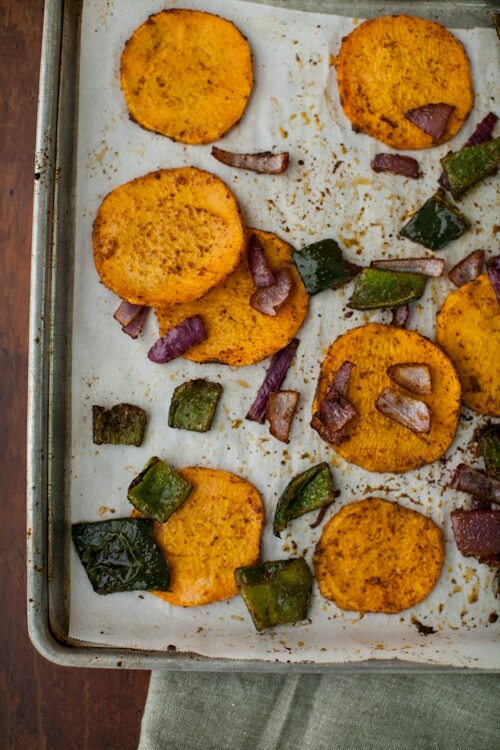 Remove from oven and carefully toss roasted vegetables with lime juice and cilantro. Preheat grill or skillet over medium-low. 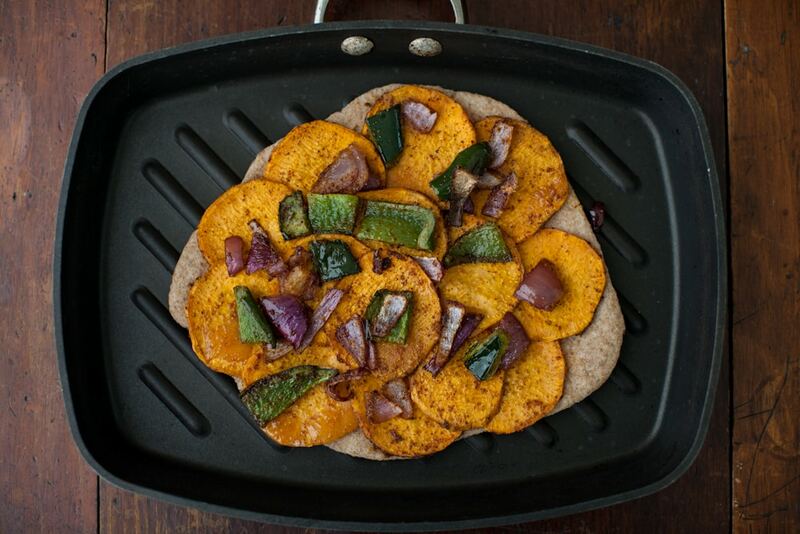 Brush each tortilla with olive oil and place one tortilla in the skillet. Cook for 30 seconds and flip then layer with the cheese, sweet potatoes, peppers, and onions. Top with other tortilla. Cook on each side for 3-4 minutes until each side is crispy and cheese is melted. Fun! This is full of so much goodness! Delicious. 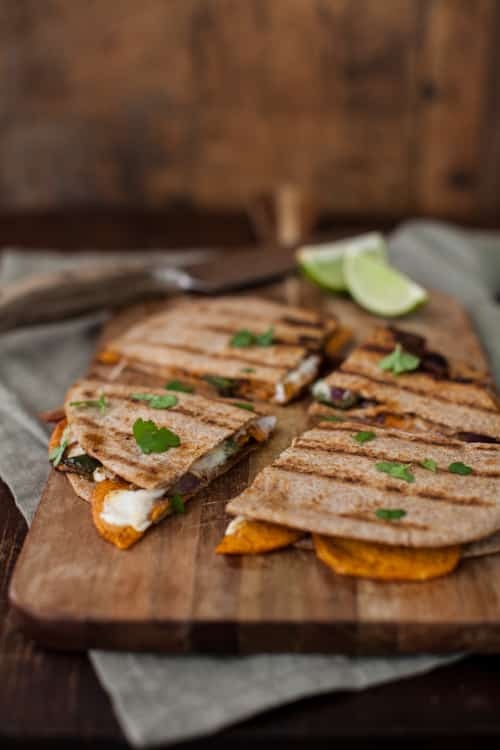 Sweet potatoes are a seasonal favorite (along with butternut squash and kale) and who doesn’t love a good quesadilla??? Holy cow that looks so beautiful! Note to self – remember to register for a mandoline. I can’t believe I don’t have one!! Especially when I see delicious recipes like this that require some seriously skinny slicing. I definitely feel the same way about my mandolin. Bought it once, used it once. Maybe it’s time to bring it back out again. 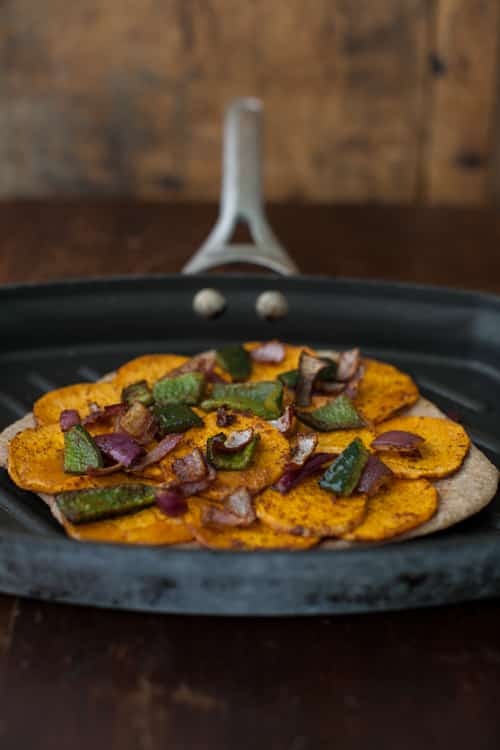 I love the idea of sweet potato in a quesadilla, they’re definitely a great quick meal to throw together on busy weeknights. This looks awesome, Erin! I just made nachos the other week that I am posting soon with these flavors, so I know it’s sooo good! And I of course love your photos! Cheese and potatoes and tortillas…what could be better? These sound delicious. I feel the same about my mandolin too, Your recipes are always a delight to behold. Thank you. 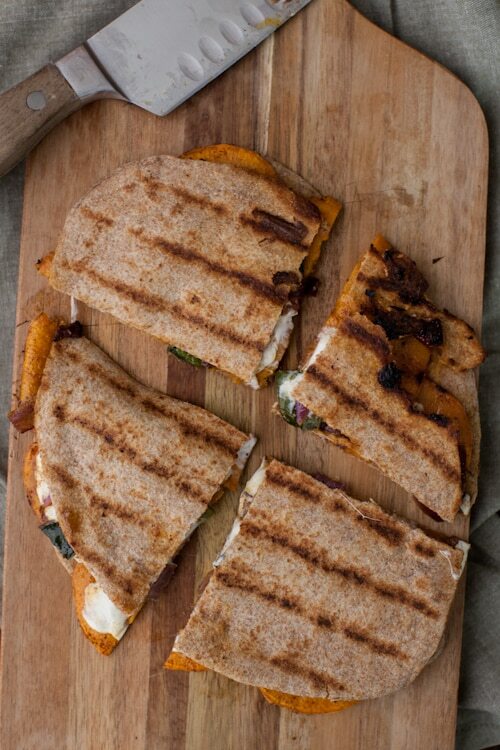 I am craving a spiced quesadilla so bad! I have got to pick up some sweet potatoes at the store! These were absolutely excellent. Thank you for a great recipe! !